The suspension system we have chosen is the Koni Heavy Track Raid series. It, along with the coils and damper were installed by Marcus Berg at Land Cruiser Services in Schwerte, Germany. Koni’s head office is in The Netherlands, and it owns subsidiaries in Germany, France, and the United States. Koni opened in 1857, and began manufacturing suspension systems for cars and trucks, buses and trailers, and railways in 1945. Koni is the official supplier for Aston Martin Racing, the Vodafone Formula One Team, and support vehicles in G3, Touring, and Drag Racing. Their suspensions and dampers come standard in Lamborghini, Ferrari, Maserati and McLaren Mercedes. 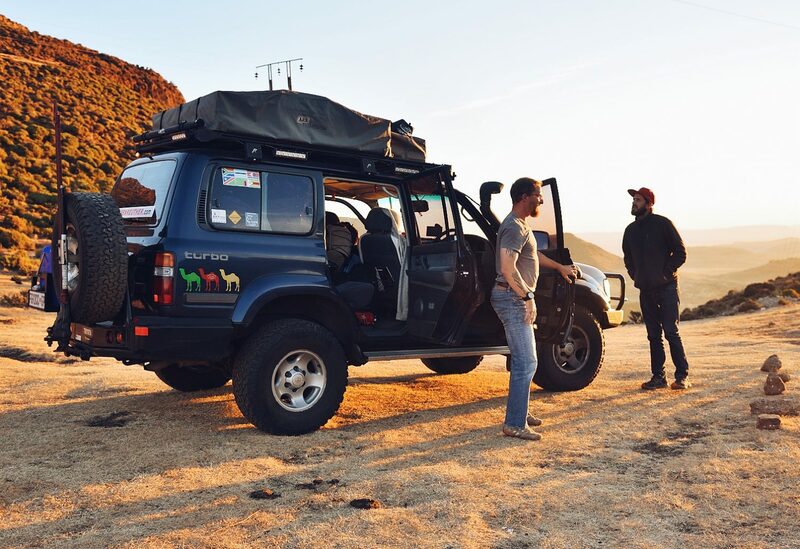 So what do these race and high end cars have to do with a truck going overland through Africa? Excellent engineering, build quality, support, and history add up to confidence, and I need to be confident in the suspension. If Koni is trusted with bearing the weight of trains, and with the lives of race car drivers, then they can be trusted to make a product capable of carrying the weight of an overland cruiser. They combined their “high level of technology and [their] 4×4 market knowledge to create a new range of offroad shocks dedicated to the raiders”. If these shocks can carry an off road rally raider across the finish line they can carry me to Cape Town. Before you laugh at my belief in their marketing, I didn’t. I did some in-depth research and actually found the thread of Len Beadell, of Beadell Tours in Australia, who placed them on his vehicle, with temperature reading stickers and checked them every few hundred km, every time he crossed long lengths o heavy corrugation, and when he completed his overland tours. He kept a meticulous log, and after reading it, you’ll find it hard to argue whether Koni makes a good off-road suspension or not. The suspension is a large bore (70mm) with double the oil volume of previous editions to ensure they stay cool and efficient. The outer tube is 2.5mm think to guarantee function even after rock impacts. They have adjustable rebound with a progressive hydraulic stop valve and a bump for added security in case of a compression shock. No vehicle modifications are necessary for installation. Are you surprised by our choice? Yes, we considered Old man Emu, but the recent reports on their reliability, and the fact that when they overheat they end up breaking led us away from them. My research found, also, that if you can manage to overheat the Konis, they get mushy rather than breaking, but that is tough to do considering what Mr. Beadell put them through from 2007 to 2012. All this said, I too will be keeping track of performance once I get them under load. We went with TJM XGS Extra Heavy Duty Raised Front and Rear Coils. They provide a 7cm lift which comes out to around 3 inches, adding the height and tread depth of the new tires, it becomes a solid 3 inches of lift. That should be just enough to give us the right amount of clearance while maintaining stability of the vehicle. I am taking this from my experience with Massi traveling through the Central Kalahari. With a similar setup, he was wanting about two more inches of lift to keep the underside from dragging through the sand with his loaded truck. I also read a lot about vehicle fires from picking up grass and not cleaning it out from all the spaces it gets jammed. I am hoping the clearance will cause the car to graze over grass rather than tearing it from the roots, and provide me with enough space to get out and inspect the undercarriage and clean it up. The coils are designed for load-bearing off-road use. This means that it just isn’t a coil spring designed for articulation and handling off-road, it is expressly designed for load carrying (accessories) and towing across off-road conditions. While it doesn’t provide a very smooth ride, unloaded, across the streets of Germany (not the point of the truck any ways), it will provide excellent control and ride quality once it is weighed down with 260l of fuel, and an additional load of drawers, food, 50+l of water, people, clothing, tents and tools. In addition to the suspension and coils we had a TrailMaster (German version by Maas) steering damper installed. I haven’t found any poor reviews of the German version, and the Deutsch company seems to be separating themselves from the U.S. manufacturer. The damper is a twin-tube with foam cell. The foam compresses when the fluid is pressed from the cylinder. The design is meant to prevent aeration and cavitation. With lower heat, and prevention of oil foaming the damper should last a long time and provide a smoother steering experience. Of course, as I have mentioned in other posts, we’ll see if these were the right choices. I’ll keep you updated.